Please join us for a very special evening to celebrate independent publishing on the occasion of the 20th anniversary of Seven Stories Press. On Wednesday, November 30, Metrograph will host the East Coast Premiere of Nelson Algren Live, a new film by Oscar Bucher with Russell Banks, Willem Dafoe, Don DeLillo, Barry Gifford, Dan Simon, and actors from the Steppenwolf Theatre. Followed by a discussion with Bucher, Dafoe, Gifford, and Simon, moderated by Algren biographer Colin Asher. One of the most neglected American writers and also one of the best loved, novelist Nelson Algren wrote about the dark underbelly of post-war America before it was ever fashionable to do so. Most known for the novel "The Man with the Golden Arm," Algren was a bard of the down-and-outer, boldly depicting the life of the city’s drunks, pimps, prostitutes, drug addicts, corrupt politicians, hoodlums and prize fighters. 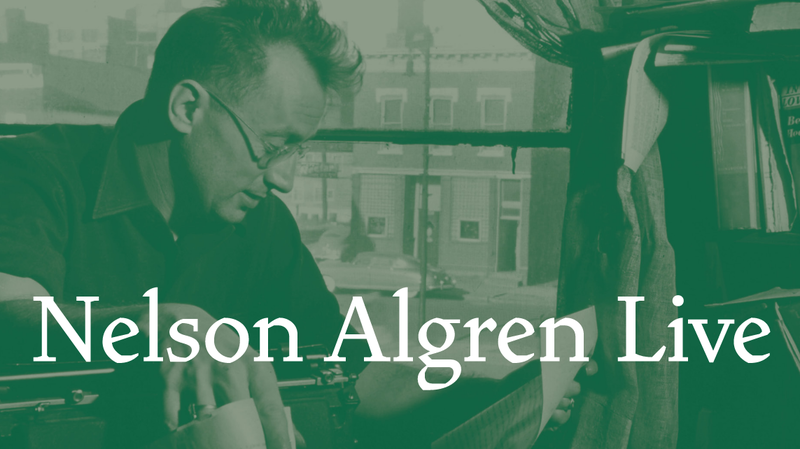 On what would have been his 100th birthday, a group of writers and actors gathered at Chicago’s acclaimed Steppenwolf Theater to premiere "Nelson Algren Live"—a celebration of Algren’s life and work in his own words. This staged reading starred Willem Dafoe, Don DeLillo and Barry Gifford, with text adapted from a play by Gifford and Dan Simon.